Ultimaker, one of the global leaders in desktop 3D printing announced an expansion in its professional 3D printer portfolio with launch of Ultimaker S5 – a new 3D printer, which the company states is future-ready as it is fully optimised to fit into existing workflows and is designed to deliver reliable results than ever before. The new Ultimaker S5 features a larger build volume, which makes it the ultimate professional solution for printing functional prototypes, manufacturing tools, and even end-use parts. In addition to the larger build volume, the S5 3D printer also features an integrated hardware, software and materials configuration. All these features offer professional users an integrated workflow. The new S5 3D printer also boasts an optimized touch screen for better user experience. It features a 330x240x300 mm build volume for printing larger objects, dual extrusion, and an improved feeder system with a filament flow sensor that auto pauses and resumes when materials run out—leaving print quality untouched. The Ultimaker S5 can also print with a wider range of materials that includes one of the most common 3D printing filaments – Polylactic Acid (PLA) to advanced engineering plastics such as Nylon and Polycarbonate (PC). Apart from the new S5 3D printer, the company also announced launch of two new additional products – the Ultimaker Tough PLA and the Ultimaker Mobile App. The Ultimaker Tough PLA filament is optimised for printing models at larger sizes such as functional prototyping, tooling and manufacturing aids. This new filament from Ultimaker has high impact strength, high stiffness, is less brittle than regular PLA filaments, which gives a matte surface finish quality. On the other hand, the company also launched a new mobile app to make professional 3D printing more accessible and easier to integrate into any workflow. The new mobile app will allow users stay updated about the progress of the print from a phone or a tablet wherever they are. Compatible with Ultimaker S5 and Ultimaker 3 3D printers, the new mobile app also notifies users when a print job is ready or when a printer needs maintenance. 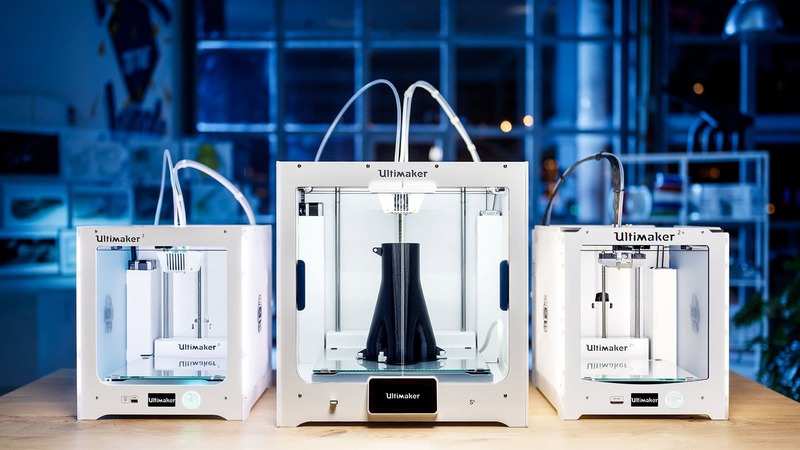 “The development of the Ultimaker S5, in combination with the new material solutions and the Ultimaker App, sets a new standard for smart and accessible professional 3D printing,” said Jos Burger, CEO of Ultimaker. Offering more details on how Ultimaker is committed towards developing a complete 3D printing solution, Burger adds, “Our commitment to building a complete 3D printing solution, from hardware to software and materials, offers our growing professional user base an increasingly integrated, automated and reliable print process with a very high succession rate”. Providing more details about the advantages that the new 3D printer offers to users, Burger adds, “The time needed to configure this new 3D printer is lower than ever, which allows users to fully focus on the creation of functional prototypes, larger objects and other designs and models that require full geometrical design freedom capabilities”.